The beginning of November marked one year since I left my job and wandered into the world of making it on my own. I gave up eight years of forward momentum in an organization, building a program and building my career all just to start at zero again. I was fine with the idea of making less money, but I didn’t think about the impact moving away from a conventional career would have on my ego. Somehow, even a year later, I’m feeling guilty about keeping a slower pace. I fill a full-time schedule with income-producing writing or production projects each week, but it’s nothing compared with the 50+ hours I used to work, plus events, a 10-day Festival and being firmly connected to my computer every night and each weekend. Now I have my nights and weekends back and, while I love every minute of them, I also fret about spending free time relaxing and enjoying what I have. Part of me still feels like I should be kept occupied each moment by someone or something else. I spent so many years confusing my success in life with my success at work that this year, though a welcome change of pace, has kind of battered my emotions. I’m learning lots of things about who I am and I don’t love everything about me. But with a really successful year of grant writing behind me and brand new knowledge about the fashion industry, I’m not ready to let my bruised ego force me back into the conventional path. As I embark on year two there are a lot of new, great projects I’m already looking forward to. And I’m placing renewed focus on finding my place so I can live well in it. 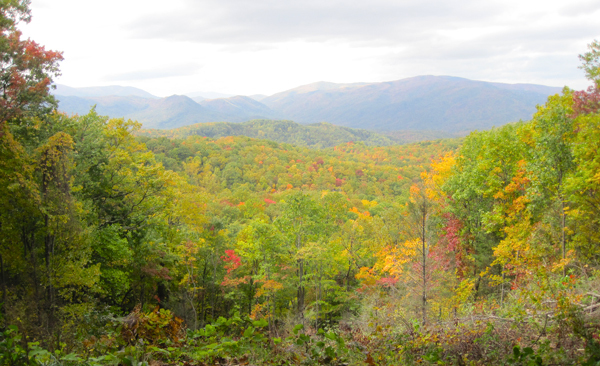 This photo was taken in the Great Smoky Mountains this October on the first fall vacation I’ve been able to take in eight years. That’s peace. Three cheers for being unconventional, because you are doing what so many want to do and are afraid. Please take any guilt that is yet hanging on and flush it down the loo, please! You are set free! You’ve found peace….priceless. You have such a work-a-holic mind! I hear you though, after grad school I didn’t know what to do with myself and all that “extra” time. Channeling it into doing what you actually WANT to do with your life instead of what you SHOULD do is the biggest challenge. Screw society and it’s definition of success. I believe that if everyone allowed themselves to do what they were ment to do in this world (which is in direct correlation to what they want to do) we’d have even more innovation, peace, and humanity. Thanks for the inspiration! I do have a workaholic mind, but I also can’t help but think about the future. What if I go back to work in the real world? Will they even have me? Here’s hoping. I like your understanding of what to do with “extra” time.